The discovery was possible thanks to a new high-resolution digital scan. One of the best-known drawings by Leonardo da Vinci, the “Landscape”, is the result of two different phases, as the artist appears to have added some details at a later stage. The discovery was possible thanks to a new high-resolution digital scan performed by a team of researchers of the Department of Architecture of the University of Bologna. The results of the study will be displayed, next to the original “Landscape”, from 15 April as part of the exhibition “Leonardo da Vinci. Origins of a Genius”, presented in Vinci, at Castello dei Conti Guidi, which hosts the Museo Leonardiano, and curated by The Uffizi Gallery in collaboration with the Museo Leonardiano. 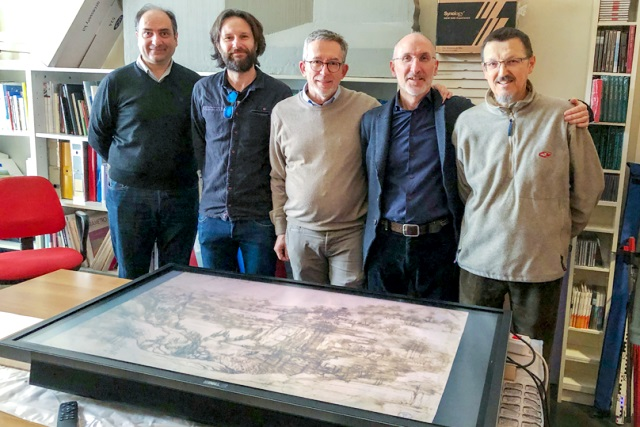 The team of researchers from the University of Bologna – formed by Marco Gaiani, Fabrizio Ivan Apollonio, Giovanni Bacci, Andrea Ballabeni and Simone Garagnani – had already worked on one of Leonardo’s masterpieces: the world-renowned “Vitruvian Man”. Now studies are focussing on the “Landscape” (known as “Landscape 8P”, with reference to the number used to catalogue the work) and on a “Study for the Adoration of the Magi”, both conserved at the Department of Prints and Drawings at The Uffizi Gallery in Florence. And researches are using much more sophisticated tools. “Compared to our previous work on Leonardo’s drawings, we have refined our methods adapting some procedures to the physical differences of the drawing and improving the performance of the readings”, explains UNIBO teacher Fabrizio Ivan Apollonio. “In particular, we created an ad hoc application, called ISLe (InSight Leonardo), which combines a number of software and methodological procedures. This tool can create a perfect digital copy of each original, which can then be used for the main activities involving directly the drawing: documentation, study and exhibition to the public. As a result, it is no longer necessary to use the original masterpiece, preventing any damage and the deterioration caused by light and manipulation. Thanks to InSight Leonardo, experts were able to produce a scan perfectly identical to the original drawing, which reproduces not just the image on the surface but also provides a three-dimensional reconstruction. The analysis revealed the imperceptible roughness of the surface caused, for example, by the pressure of the strokes or the construction lines of the drawing. A series of new clues have shown how Leonardo worked on the “Landscape” during two different phases, adding some elements at a later stage. “The peculiarities of the material and the specific morphological configuration of the “Landscape” show a greater deformation of the paper surface compared to the Vetruvian Man”, said UNIBO teacher Marco Gaiani. “This called for a more accurate examination, in order to create a more accurate reconstruction of the characteristics of the drawing”. Thanks to the digitalization of the work, specialists now have a new analytic tool, which can be used even remotely. This also gives the public the opportunity to examine the drawing closely and appreciate its smallest details on a high-definition touch screen. “Thanks to the experimentation process applied to the different case studies, we now have a digital archive of drawings that accurately describes the original physical information”, said Apollonio. “We were also able to investigate and implement techniques for the acquisition and the three-dimensional creation of graphic signs. This allowed to provide essential information on Leonardo’s entire drawing process, offering experts new clues to create interpretation keys which previously were impossible to find”.